Suddenly Summer seems like it is slipping away. Even with Labor day very late this year (Sep 7th), it seems like it has been a short summer. Perhaps it is because so many schools are opening up in August these days, forcing families, parents and teachers back to the real world a little sooner. 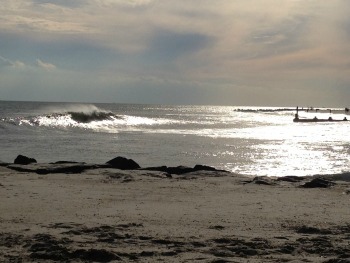 While our days are suddenly getting a little shorter, I have to say that there is a lot of summer left in Cape May. In fact, Cape May is at its best as we slip into September. If you find yourself facing the end of summer without having made a trip to Cape May this year, it is NOT TOO LATE! Though our weekends are pretty much spoken for through mid-September, we still have some very nice openings during the last week of August, into September. It is a fabulous time to visit Cape May because the crowds are certainly diminished, the weather is typically wonderful, everything is still operating at full swing in Cape May, and the beach is absolutely beautiful (this photo was taken in early September). I suggest you dust off a couple of those vacation days you’ve been sitting on and put them to good use at The Queen Victoria. I know you’ll be happy you did. We’re always happy to assist you in finding the best possible room for the dates you want to visit, or the best dates for the room you want to stay in. Call us at (609) 884-8702 to get started. You can also Reserve Your Room Now on our website. They say that great things come in small packages. I always assumed that meant that jewelry was the best “go to” gift for my wife, whatever the occasion (remember, I can’t give her a Queen Victoria gift certificate). It turns out, though, that the phrase has a larger application. In this case, I’m thinking of the Princess Beatrice room. Princess Beatrice is a 3rd floor “Petite Standard” room located in the House of Royals building. Though it is small, it is a very pleasant, comfortable room, with a surprising amount of practical space. It has all of the basic amenities that all of our rooms have, with the added benefit of an Ocean View! If you’re interested in a comfortable, elegant room and want to manage your budget, I suggest you give the Princess Beatrice a try. Though it is our least expensive room, it is as lovely as any other. Cast your Ballot for The Queen Victoria by August 26! Since 2008 our loyal guests have faithfully voted for us in the CapeMay.com “Best of Cape May” survey, naming The Queen Victoria the Best Bed and Breakfast in Cape May for 7 straight years. We’re hoping to be awarded that title again this year. In early August they opened up the balloting again for the 2015 contest. I sent out an email blast about the contest then, and I know that many of you have already voted on our behalf. Thanks SO MUCH to you all. Guests who have stayed with us for the first time this August, after my last appeal. 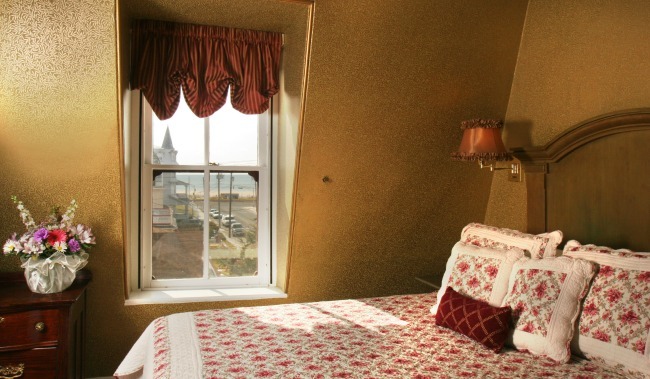 Seriously though, if you haven’t yet voted for your favorite Cape May B&B, whatever the reason, I hope that you’ll consider taking a few minutes out of your busy life and cast your ballot for The Queen Victoria. There are 3 categories that we feel we are contending for this year: “Best Bed & Breakfast” and “Couples Friendly” in the Accommodations section, and “Favorite Victoria Building” in the Leisure section. 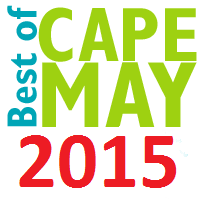 Be sure to vote for your other Cape May favorites too! As you can see, this is a GREAT time to visit Cape May. Many of these events are held mid-week too, so you can take advantage of the few openings we still have left. As of this writing we still have one room available for the weekend of Sep 18/19. The oldest building at The Queen Victoria is the “House of Royals”. That means that is has some of the oldest woodwork as well, as was until recently quite evident in the shop windows on the building. 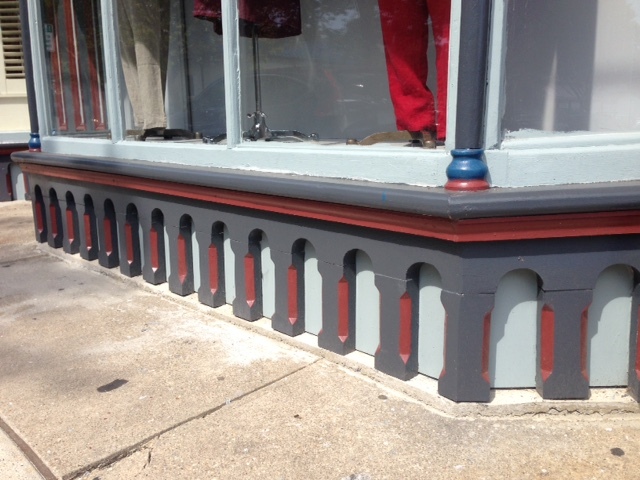 As I write this, we’re wrapping up the rebuilding of the window support systems, including the decorative pieces you see here. It was a big job involving hand chiseling, custom made spindles, rails and moldings, and lots of interesting angles. Thankfully, we’ve got a talented woodworker on our maintenance staff! These aren’t the most ornate or elaborate pieces of Gingerbread at The Queen Victoria, but we’re excited about the ongoing restoration and preservation of our property. This was a project waiting to happen for a long time and I’m thrilled to have it completed. Have you ever noticed that gift giving is a lot like painting a bridge? No? I’ve recently come to this opinion because it seems like gift giving occasions in my family come faster and faster, and by the time the cycle is complete, it is time to start it all over again. See, just like painting a bridge (or an old building in Cape May). I have to tell you how fortunate you are, however. All you need to do is make a really creative, thoughtful gift purchase decision one time, and then never have to struggle to find the perfect gift again. To make it even easier for you, I’m going to share with you what that perfect gift is. They’ll love it when you give it to them. I could probably continue on for a while longer, but I imagine you’ve got the idea. Now all you have to do is wait for that next big gift occasion and either purchase a gift certificate from our website (buy one now! 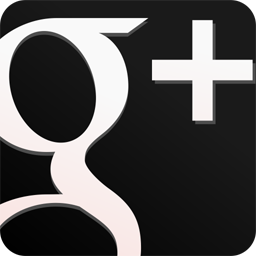 ), or call us on the phone at (609) 884-8702. SO EASY! Last month I featured a picture of a whale spotted off of the beach in Cape May. There was even a whale spotted just a few yards off the beach a couple of weeks ago, a picture of which I posted to our Facebook page. Though whales are increasingly present in our coastal waters, you are much more likely to see dolphin if you go on a whale watching cruise. The truth is, though, that you don’t really have to go on a Whale/Dolphin watch cruise to see a lot of dolphin during your trip to Cape May. Here is a fun picture of a beautiful pair of dolphin playfully leaping out of the water. Somehow it is so much more fun to see them do this in the wild than in a captive setting. 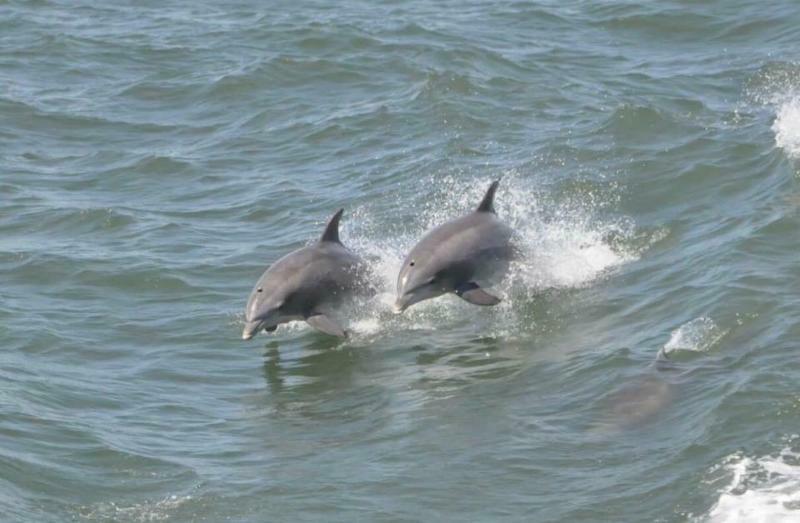 There are so many dolphin this year in Cape May that if you don’t see them during a visit to our beach, then you probably didn’t look at the water. Seriously, they are evident somewhere on the horizon almost every time you look out over the waves. 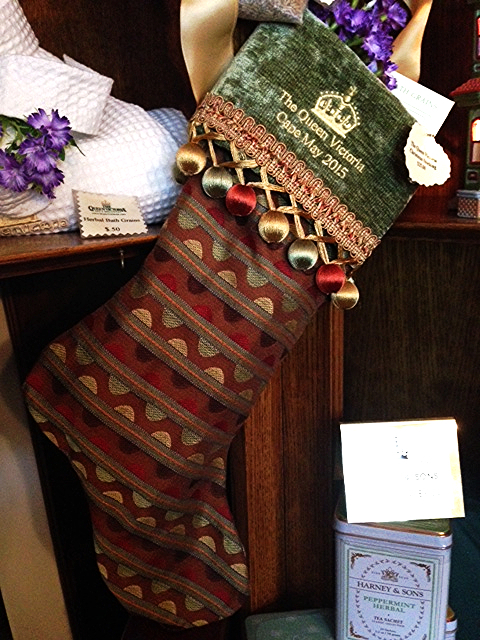 Even though I’ve always been one of those people who cannot stand the thought of stepping into a Christmas store during the summer, I’m breaking with my instincts and featuring our 2015 Christmas Stocking as our Gift Shop Item of the Month. This beautiful custom designed and hand crafted (in the USA!) stocking is now available in our gift shop. Anna Marie has convinced me that it is NEVER too early to start shopping for Christmas. These stockings make a lovely gift, especially for somebody (like your spouse!) that loves The Queen Victoria. 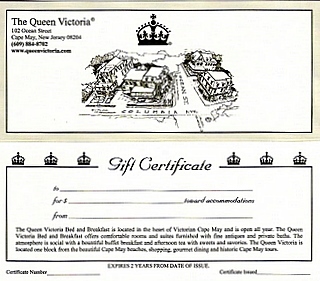 About the only thing better than a Queen Victoria stocking for Christmas would be a trip or gift certificate to The Queen Victoria. Better yet, put a gift certificate to The Queen Victoria IN one of these stockings and let Santa hang it on the mantle Christmas Eve. The other day I came across an article in a South Jersey paper that reported the Cape May Zoo had been ranked one of the Top 10 zoos in the United States. 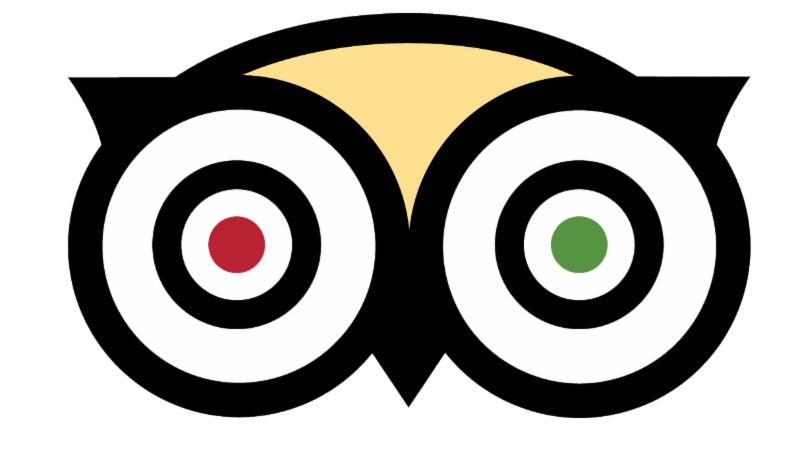 In fact, it was ranked Number 5 according to Tripadvisor. I’m not surprised. I certainly rate the Cape May Zoo as a “Must Do” for anybody who appreciates the natural world, especially on a less than perfect beach day. 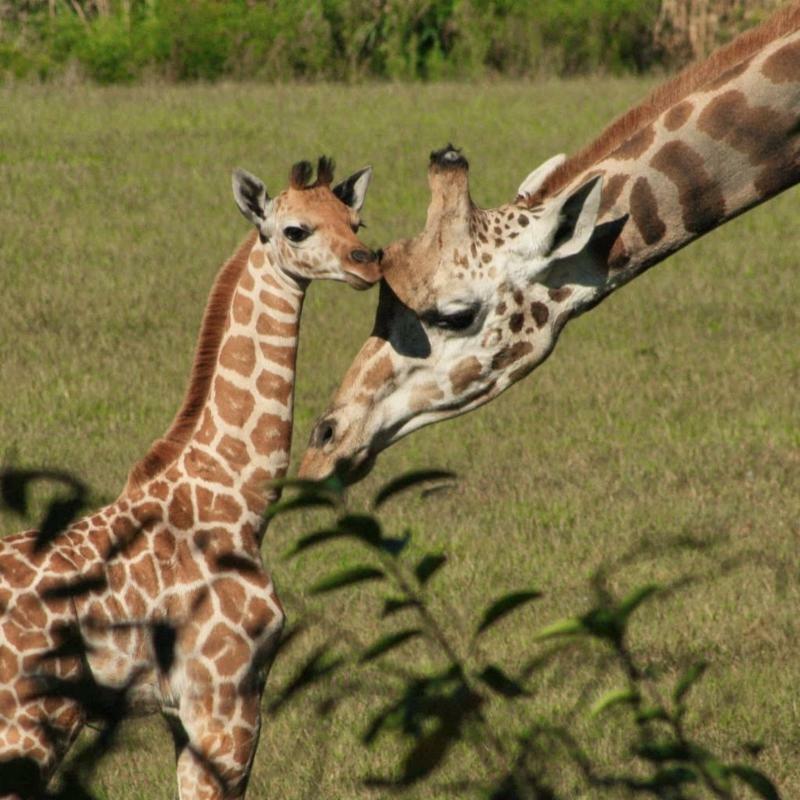 These beautiful giraffes are just one of the MANY exotic and fascinating animals to be found at the Cape May Zoo. The Cape May Zoo is large, covering over 85 acres, with a collection of about 550 animals representing some 250 species. One of the most significant species found at the zoo are the Snow Leopards. Cape May Zoo’s snow leopards have been successfully bred over the last few years, producing a couple of litters of adorably cute kittens. The Species Survival Plan recognizes the Cape May Zoo as a vital partner in the preservation of this endangered species. One of the best things about the Cape May Zoo is the admission fee, which is $0. That’s right, it is absolutely free. I think that most visitors to the zoo gladly make donations to the zoo on their way out of the gate, however. As the weather cools, the Cape May Zoo is certainly an attraction you’ll want to check out during a Cape May visit. It is very hard not to love Union Park. It is certainly one of the most beautiful and elegant restaurants in Cape May. 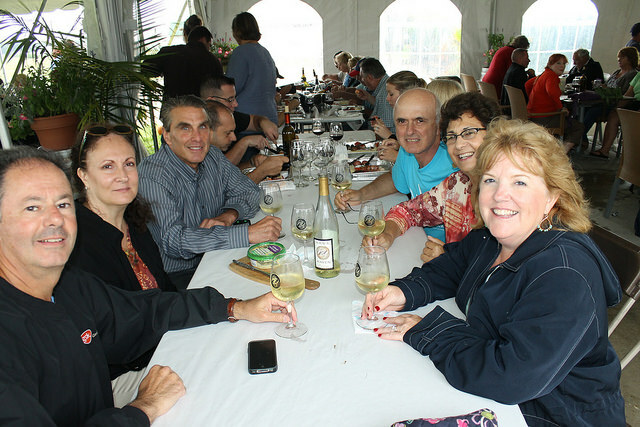 It also has some of the best food and service to be found in Cape May. For the last couple of years, it has been our restaurant of choice for our anniversary celebration. Believe it or not, the picture above is not even an entree, but a VERY special appetizer called the “Seafood Plateau”. 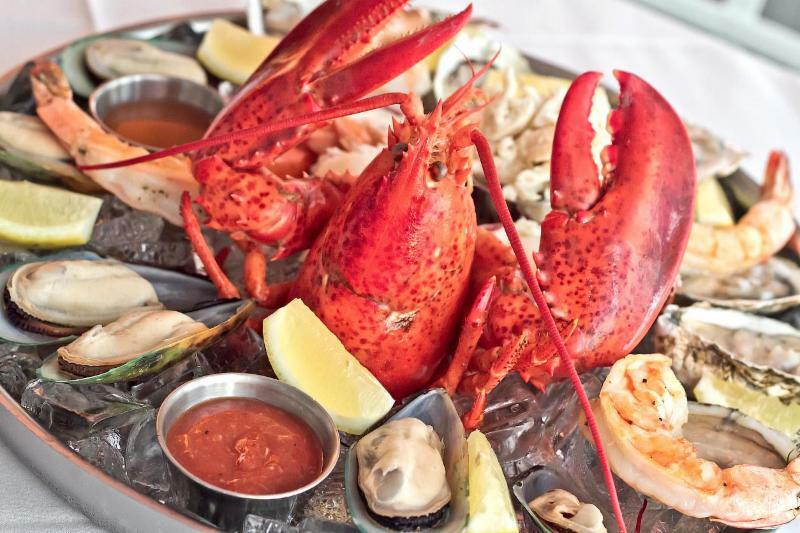 This amazing assortment of seafood is served cold on a iced platter that is elevated off the table, thus the name. I think it is also given that name because it would be hard to top! It is a splurge, even if ordered as an entree (which it could certainly be, and is worth every penny. We’ve ordered it for every anniversary dinner we’ve enjoyed at Union Park. What’s good besides the plateau? Everything! I’m very fond of the Short Ribs, while Anna Marie is partial to the Salmon. No matter what you order, however, I’m sure you’ll be very pleased with it. Union Park is a short stroll from The Queen Victoria, located almost directly across the street from the Cape May convention center, making it an ideal place to have dinner when attending one of the many excellent concerts or events held in that venue. 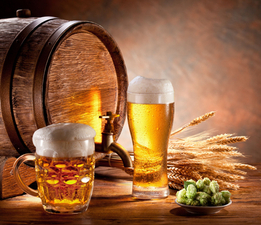 Union Park is also a BYOB, making it even more attractive to you wine lovers.